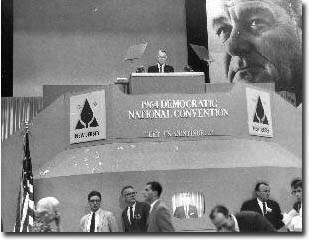 FOIA author John Moss speaking at 1964 Democratic Convention. LBJ looms. (Credit - John Moss Foundation). "LBJ loath to approve information act in 1966"
"The U.S. president worried about giving up secrets -- 40 years ago"
"LBJ had doubts about the Freedom of Information Act"
This back story behind Johnson’s grudging signature highlights some constants – the government’s resistance to outside scrutiny – and some surprising role reversals, featuring then-congressman Donald Rumsfeld as a FOIA champion and then-White House aide Bill Moyers as a FOIA opponent, at least for a time. A Democratic congressman from Sacramento, California, the late John Moss, was the real hero of the Freedom of Information story. Supported by extensive press coverage and active lobbying by newspaper editors, Moss led hearings beginning in 1955 that documented and denounced excessive government secrecy. But as long as Eisenhower was president, Moss could hardly find a Republican co-sponsor for his proposed openness reforms. But by the spring of 1966, the Senate had passed its own version of Moss’s legislation and Moyers had heard unanimous support from the journalists he was dealing with as press secretary. Other White House staff were getting the idea that the train was leaving the station. White House counsel Milton Semer talked directly with Moss, connected Moss with Moyers, and even suggested to Moyers that he “exploit the fact that the President is under pressure from the bureaucracy to veto,” as a way of arguing that the bill would actually help the President bring the “permanent bureaucratic interest” more under control. By May and June 1966, the White House documents show quiet lobbying by Moyers in favor of the legislation, advising the newspaper editors (see Document 9, page 2) what kind of “sharply briefed exhibit” of editorials would have the most impact, and forwarding quotes to White House staff from previous Johnson speeches about the perils of secrecy and the virtues of openness. President Johnson clearly shared those very mixed feelings – he personally handwrote “No ceremony” across the bottom of a June 24 memo about the possibility of a signing event with leading editors and legislators. The last drama of the Freedom of Information signing saga was over the president’s statement. As Justice recommended, it endorsed the rollback House report with three paragraphs of cautionary language about military secrets, personnel files, confidential advice, executive privilege, and investigative files. In fact, the signing statement includes more about the need to keep secrets than the urgency of openness. Today the U.S. government answers more than four million FOIA requests a year, the majority from veterans and senior citizens seeking information about their benefits and service records. In 1966, the U.S. law was the third in world history, after Sweden and Finland; but today, more than 60 other countries (most recently Uganda and Germany) have enacted similar laws that open access to government information (see www.freedominfo.org for the new 2006 global survey). Document 31: Statement signed by Lyndon B. Johnson, “Statement by the President,” Attached to Cover Note. Includes Variants, (1): Unsigned Draft; (2) Draft II Annotated by LBJ himself, (3) Annotated Draft with Handwritten Note from G.C. 1. For the complete Legislative History of the FOIA - click here.